The Queen of Oak Bay ferry joins a long, illustrious list of vessels used for marine research off our coast. The B.C. 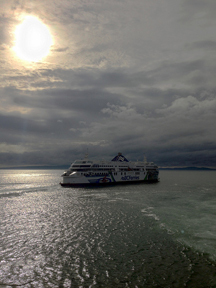 Ferries vessel was recently outfitted with scientific instruments to sample ocean-surface and atmospheric conditions as it travels its Horseshoe Bay, West Vancouver–Departure Bay, Nanaimo run. The scientific equipment was added during a $7.7-million upgrade that began last November, and was provided by Ocean Networks Canada, a University of Victoria-based marine observatories network. It is the third B.C. Ferries vessel to be enlisted for research by the network. The Spirit of Vancouver, which plies the Swartz Bay–Tsawassen route, was outfitted as a mobile observatory last November, and the Queen of Alberni, of the Tsawassen–Duke Point run, began collecting data in 2012. Information collected by the ferries will supplement seafloor data obtained by Oceans Network Canada’s 50-kilometre-long VENUS coastal seafloor-cable observatory that lies at the bottom of the Strait of Georgia, the Fraser River Delta, and Saanich Inlet. Other ships that have added to our knowledge of B.C.’s marine environment include the Canadian Coast Guard Pacific fleet. Research vessels such as the CCGS Vector, John P. Tully, W.E. Ricker, Neocaligus and R.B. Young monitor midshore and offshore ocean conditions. The ships have, at times, been integral to Ocean Networks Canada observatories, but they also conduct federal research. The ships that operate out of Pat Bay Coast Guard Station monitor the ocean by regularly collecting seawater and biological samples from about 80 stations located in the straits of Georgia and Juan de Fuca. They also sample conditions along a 1,500-kilometre line stretching west from Vancouver Island. The ships combine high-tech electronics with some age-old sampling technologies, including the use of bottles and nets to collect seawater and sea creatures. Electronic sensors automatically measure properties such as temperature, salinity and fluorescence, whereas the scientists analyse the seawater’s oxygen, nutrients, chlorophyll and other physical, chemical and biological properties. The data provide insight into ocean climate, circulation and currents, local biology, and much more. The information helps the researchers understand the primary processes at play in the ocean of our region. Over the decades, they’ve observed emerging trends, such as gradual ocean warming and decreasing oxygen levels. Naturalists voyaging to the northeast Pacific Ocean during the Age of Discovery would recognize some of the sampling techniques used today. When Captain James Cook and Captain George Vancouver explored these waters and surveyed the B.C. coastline in the late-1790s, their accompanying naturalists also collected sea creatures using bottles and nets. For sea birds and coastal mammals such as otters, seals and sea lions, instruments of capture included clubs and guns. Early scientists were interested in the Big Stuff—larger plants and animals—over chemistry and nutrients. Surgeon-naturalists William Anderson and William Ellis, who traveled with Cook to the North Pacific from 1776 to 1780, and naturalist Archibald Menzies, who voyaged with Vancouver aboard the HMS Discovery from 1791 to 1795, packed and preserved thousands of critters in barrels and bottles to ship back home to museums and universities in Britain. Some of the specimen didn’t make it, and disintegrated or decomposed en route. Later naturalists, aboard ships such as HMS Blossom (1825–1828), the Vénus (1836–1839), USS Vincennes and Peacock (1841), and USS Albatross (1886–1896), investigated the economic viability of the north Pacific whaling industry and otter- and seal-pelt trade, and inventoried potential commercial fisheries in the region. Bit by bit, through the sheer number of voyages and collected critters and information, the naturalists built pictures of the natural and economic resources of the northeastern Pacific region, promoting its annexation into seafaring empires and worldwide trade networks. Today, the work continues, but with more finesse and at finer scales. Now, however, the questions being investigated extend beyond mere economics and trade into ecosystem health, regional sustainability and global change, and what those might mean for B.C. and for Canada. The next time you wait at Swartz Bay to board the ferry to the Mainland, remember the vessel you sail on may be serving as more than a transport ship. It may also be collecting information that will help us better understand the ocean around us. A version of this editorial appears in the September 27, 2015, Victoria Times Colonist.